Coach Frank Thomas, Harold Drew, Paul Burnham, Paul W. Bryant. The 1938 Rose Bowl marked the fifth time Alabama had been invited to take part in the New Year’s Day classic and the second time they were led there by head Coach Frank Thomas. 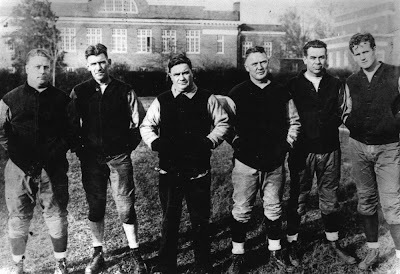 Alabama's 1936 football season ended on an unsatisfying note. A scoreless tie against Tennessee was the only blemish on an undefeated campaign but proved enough to cost the Crimson Tide the Southeastern Conference Championship as well as an invitation to a bowl game. Alabama ended fourth in AP polling at the end of the season. Entering the 1937 campaign the Crimson Tide boasted a couple dynamic players. Senior Leroy G. Monsky was a consensus All-American at guard while fullback Joe Kilgrow earned national honors as well. But the Alabama roster lacked the depth of years past and Thomas knew it. 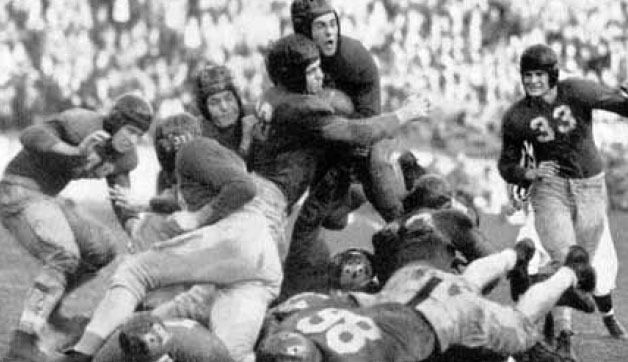 Throughout the 1937 season, Thomas used the bowl snub to motivate his players. The goal seemed that much closer each week as the Crimson Tide crushed another opponent. A come from behind win against Vanderbilt in Nashville on Thanksgiving Day sealed the undefeated season. 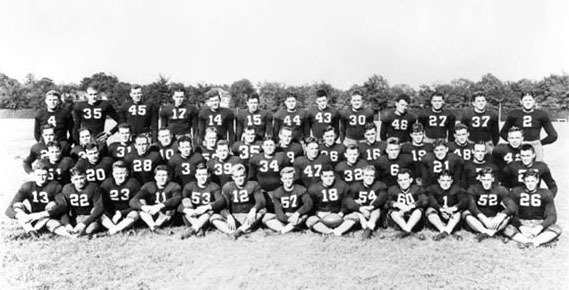 Alabama claimed the SEC title and garnered the invitation to play in Pasadena 1938. Meanwhile, out on the West Coast, the University of California was fielding one of its strongest squads ever. The Golden Bears were led by Leonard B. "Stub" Allison who had taken over as head coach in 1935. His first season in Berkeley produced a 9-1 record and tie with Stanford for the Pacific Coast Conference title. The 1936 campaign had resulted in a disappointing 6-5 effort but things shaped up quite differently the season that followed. The 1937 squad was a powerhouse and soon came to be known as the "Thunder Team" due to their physical style of play. No less than five players on the squad ended up earning All-American honors at the end of the season including center Bob Herwig and halfback Sam Chapman. The Golden Bears plowed through the Pacific Conference during the 1937 season slowed only by a scoreless tie with Washington. During the 10-game campaign Cal amassed a 201 to 33 point differential and racked up no less than six shutouts. The conference title was followed with an invitation to the Rose Bowl. The Cal team had hoped for a matchup with the defending Rose Bowl champions, the University of Pittsburgh who had completed an undefeated regular season. But the Panthers opted to decline the invitation and the Tournament of Roses committee extended the offer to Alabama. A record crowd of more than 90,000 was on hand in Rose Bowl stadium in Pasadena on Jan. 1, 1938 to see the Pacific and Southeastern conference champions go at it. With clear sunny skies and temperatures at 75 degree, Southern California was at its mid-winter best the 23rd Annual Tournament of Roses football game. The contest started as a defensive battle as both teams were unable to reach the opposing end zone during the first quarter. For Alabama it proved to be the calm before the storm. Early in the second quarter Alabama was driving for a touchdown when Hershel "Herky" Mosley completed a pass to Charlie Holm at the Golden Bear’s seven-yard line. But the receiver bobbled the ball and Cal’s Herwig took it from him and killed the Crimson Tide drive. A bit later in the quarter it was Mosley’s turn to be the goat, fumbling the ball at the Cal 49-yard-line. The Golden Bears then began a relentless drive down the field that the Crimson Tide defense was unable to stop. Twelve running plays put Cal on the Alabama 3-yard-line and a smartly executed end run by tailback Vic Bottari provided the touchdown. A successful extra point kick gave Cal the lead 7-0. The scenario was much the same in the third quarter when the Golden Bears used the powerful running game to drive the ball 48 yards in nine plays. Bottari scampered the final five yards into the end zone on the exact same end run that had worked in the second quarter. The extra point kick failed this time and Cal was up 13-0 which proved to be the final margin of victory. Bottari finished the day with 34 carries for 137 yards and two touchdowns earning him player of the game honors. Whatever success Alabama was able to achieve on offense were hamstrung by turnovers – four fumbles and four interceptions. One fumble killed a Crimson Tide drive at the California one-yard-line and another Alabama scoring drive ended the same way at the Golden Bear’s six. Cal caught more of Alabama's passes than Crimson Tide receivers did (4 interceptions vs 3 completions). For Cal, the win gave the Golden Bears their first undefeated season since the "Wonder Teams" of the 1920s and claim to their last national championship. Two of the polling services ranked Cal’s undefeated season national championship worthy (although Pitt is the widely recognized title holder for 1937). Alabama was forced to return to Tuscaloosa from California empty handed for the first time in five trips out west. While thousands of well-wishers had met the team at the train station each time before, this time it was different. The depot was deserted except for the family members of the players and coaches. "It appears," Thomas told his wife as they drove home. "Nobody loves a loser."